2nd prize 500 euro and publication in Southword. 4 further prizes of 120 euro and publication in Southword. Now, if you are concerned about the 3000-word limit, that you haven't got a story "long enough", let me calm your fears. 3000 words MAXIMUM and there is no minimum. Send in a story that perfectly fits its length, whether that be 200 words, 1500 words, or 2999 words (but not 3100 words, that one won't be eligible!). I have no quantity bias: grip me and I'm yours for as short or long as your story takes. So, for the last time, I say: Wow me! 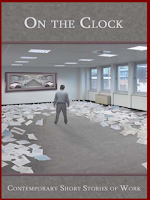 I am delighted that my story Evie and the Arfids is being reprinted in a brand new anthology, On the Clock: Contemporary Short Stories About Work. When I heard about this call for submissions I knew I had to send in this story, which is in my book and is about a middle-aged divorced woman who decides she needs to do something with her life and starts work at a company doing something nefarious with RFID tags. I am really happy to see Evie getting out and about even further. Anyhow, On the Clock, which is edited by Jeff Vande Zande and Josh Maday, will be published by Bottom Dog Press in September and I'm thrilled to discover I am in excellent company: Michael Martone, Sean Lovelace, Matt Bell, Bonnie Jo Campbell are just those names I know already. (It seems that Dustin Hoffman is one of the contributors - another talent of his, or another Dustin?). Click here to download a PDF about the anthology with more information and an excerpt. Great cover, isn't it? Forward judge: Too many poetry books published because "everyone's got a right to get a book out"
"The books were all laid out on a table and I looked at the covers and the titles and thought how carefully each had been chosen ... the ambition and the beauty and the sensitivity," he said. "But an awful lot of them seemed to be published just because they existed, really. That's too big a number of books in one year in one country to put out. I think it's something to do with the democratisation of everything – that everyone's got a right to get a book out ... I've got the feeling that sometimes it's more about desire than worth." I read this quite late last night and then lay in bed thinking about why it upset me so. Too many books? 147? Why did Williams have to put it like this? What point was he trying to make? He could have just said that he didn't rate the majority of the poetry collections very highly - his subjective opinion - but rather he took the chance to criticise the industry as a whole. What he seems to be saying is, Publishers, stop publishing so many poetry collections because not everyone should have a book. Not everyone has the right to have a book "just because it exists". OK, so how do I feel about this "publishing it because it exists" and the word "right"? 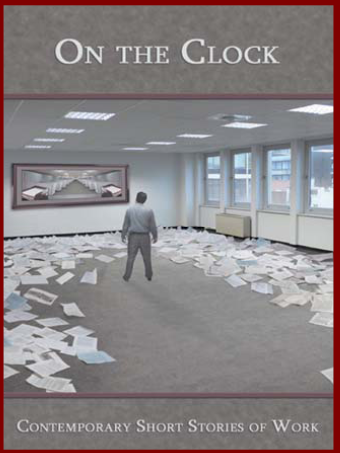 Does everyone have the right to be published, to be chosen by a publisher? No, I don't believe that. The word "right" doesn't seem to me to encapsulate what writing and publishing is all about. But... writing and publishing are two different things. Does everyone have the right to write? Sure, why not? Do it, if you want, must, need. Do it as a hobby, do it as a profession. What right does anyone else have to stop you? But just by writing, this doesn't mean that there is some entitlement inherent in the act that leads to publication. I never really expected to have a book. I dreamt about it, but never felt the world owed it to me just because of the time I'd put into writing the stories. 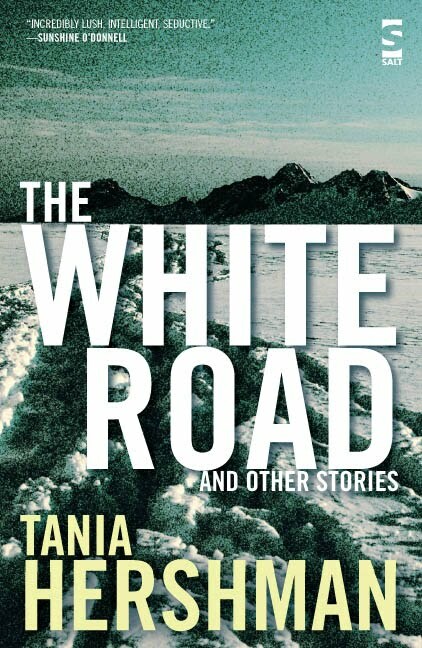 And of course everyone now has the option of doing it themselves, which is, I believe - at least in the short story world - seen as an increasingly respectable way to produce your book, given the current climate. I don't see anything wrong in it, anyway. I don't know if the Forward prize accepts self-published collections. I just looked it up - they don't. So Williams is criticising the publishers. I would be delighted if I heard that 147 short story collections were published in the UK in one year. Thrilled! Of course, I wouldn't expect to enjoy them all, would expect standards (which of course I set myself, in my own head) to vary. But it would be a great sign of the health of the market, no? Why would I choose to say that too many were published? I am trying to put myself in Williams' shoes. Perhaps if I felt great writers weren't getting published because of something wrong here, then I might make this comment. Is this what he's saying? Is he saying funding that many poetry publishers receive is being diluted/wasted, in his opinion? I really can't make my mind up here - or rather, I can't enter into his mind.147 poetry collections? Compared with the 1000s of novels that are published? It's nothing. Can anyone shed any light on this for us? ... Valerie O'Riordan with her story, Mum's the Word. Congratulations, Valerie! 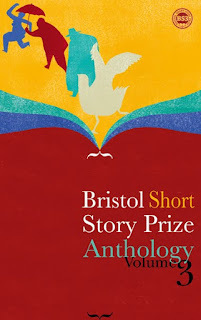 Congratulations to the 2nd and 3rd prize winners, Ian Madden and Rachel Howard, and the entire shortlist, all of whom are published in the Bristol Short Story Prize 3 anthology, which has the gorgeous cover above. Buy your copy now! It was wonderful meeting many of the shortlisted writers last night, and hearing the ever-inspiring Sarah Salway share her thoughts about the short story, urging us not to waste our lives reading anything that declares either that "the short story is dead" or that "the short story is being revived" because neither is true, the short story is and always has been alive and well! She suggested that the next time we run into someone who says "I don't read short stories", we suggest a few titles they might like to try, an excellent idea. One of her recommendations is Lydia Davis, whose Collected Stories I am reading now for review for The Short Review. It is mind-blowingly good! All in all, a great short-story-filled birthday yesterday, now I'm recovering and wondering what this new decade will bring. One thing is that Sarah S and I will have news to share regarding short stories, but more on that soon. Now, I need to get on with some writing! 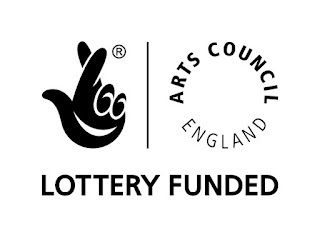 Yesterday, J was telling me he'd heard the head of the Arts Council being interviewed about the huge reductions in their budget, and I said to him: Ok, I've resigned myself to the fact that I'm not going to get a grant. 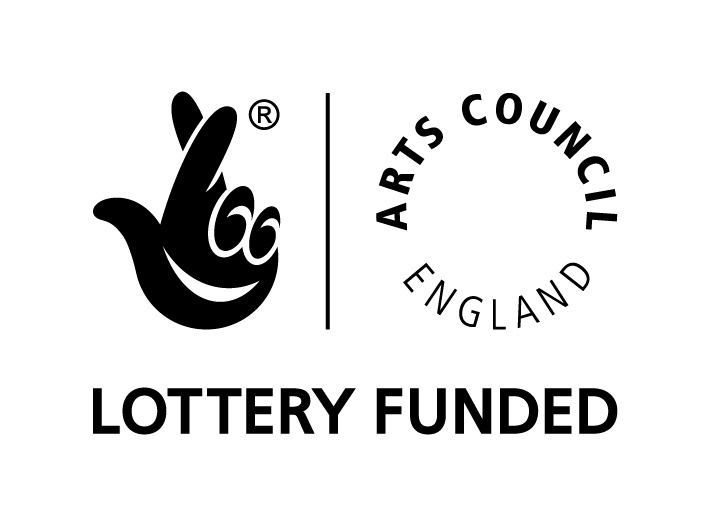 This morning, 24 hours before my birthday, I get a large envelope from the Arts Council and... whoo-hoo, they've awarded me a grant to work on a biology-inspired short story collection!! This is not just an amazing boost financially, it is a real validation to me that they think I'm doing something worth funding. 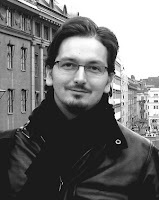 And it is a vote of confidence both in short story collections and in science-inspired fiction. Yay! And.. now I feel like what I'm doing's a "proper job". Amazing. My project is for a collection of short stories inspired both by current research in several biology-related labs in Bristol University and a fictional response to a 100-year-old biology text book. I won't go into more details about that now, but over the next 18 months, I'll reveal more, as I get going. I have been in a kind of limbo ever since I submitted the application 5 1/2 weeks ago, not feeling I can really get stuck into anything. And now I can, which is the best part. I have the "next thing" I've been waiting for, really since my book came out, which is almost two years ago. Ok, got to get to it! I am very honoured to have been interviewed by Andrew Philip, author of the excellent The Ambulance Box poetry collection, over on his blog today. He asked some great questions, even about my poetry - which is woeful and frankly almost non-existent! but I did use the word "sestina". Thanks for having me, Andy! I really enjoyed this post, very thought-provoking in terms of our evolution as writers. Do we get stuck in one stage or are we moving smoothly through them all? I am still pondering that one. Read the full post here. 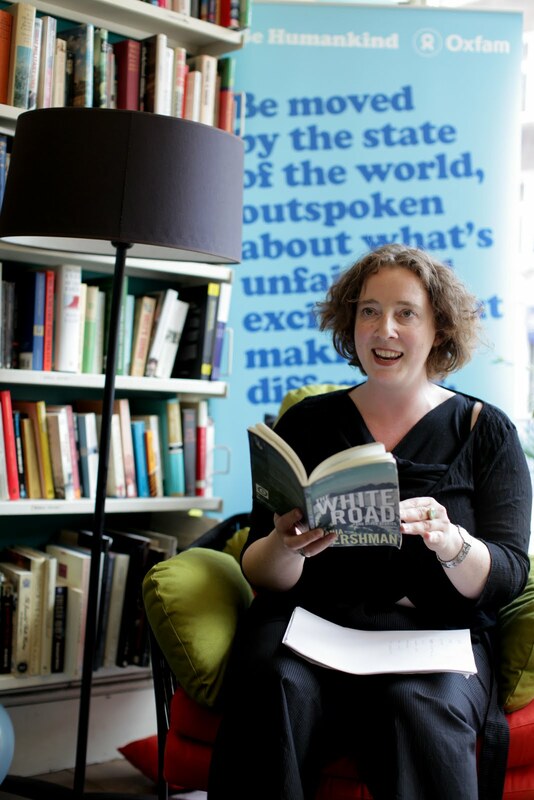 This is me taking part in the Oxfam Bookfest 24-hour Readathon at Oxfam Books in Marylebone High Street in London last Monday. I don't normally like pictures of me at all, but I like this one, taken by the Oxfam photographer - an action shot! I read for 20 minutes - I had thought I'd read 3 flash stories and then realised I would need rather more than that so ended up reading 9. They seemed to go down well, I think, despite the traffic noise in the background and the general hubbub in the shop, and it was a real honour to be involved. An added bonus was when I discovered that the reader after me was Kate Mosse, founder of the Orange Prize. I risked missing my bus back to Bristol to stay and hear her read, and then accosted her afterwards to thank her personally and tell her how being commended for the Orange Award for New Writers last year changed my life. It really did. She was lovely, gave me a hug - and was kind enough to mention me in her article about the Readathon in today's Guardian Review! Talking about reading, I am in the thick of reading entries for the Sean O'Faolain short story competition (deadline July 31st, 3000 words max, no minimum, get your entries in now). It is quite a daunting task but certainly has taught me a thing or two about what it takes for a short story to grab me. As an illustration, I picked up the new Granta magazine today and intended to just flip through it before settling down. But I read the opening paragraph of the first story, Missing Out by Leila Aboulela and it was as if the story grabbed me by the throat. I had this overpowering physical sensation that I just couldn't stop reading. It was amazing, this had never happened to me quite like that. I kept reading and there was never any point at which the writer allowed me to stop. Just wonderful. I thought about this afterwards. 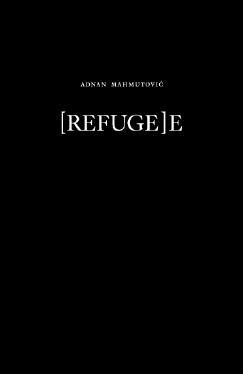 What is it about words on a page that can actually compel the reader physically? I mean, the whole magazine is printed in the same font, the layout looks the same, but this particular arrangement of letters seized me somehow. This happens to me very very rarely and what I think I can put my finger on is that Aboulela threw me right into the action - no explanation, no preamble, no introduction, just two characters, a mother and a son, in the midst of doing what they were doing - and this is what drew me so far in in just that opening paragraph that I felt I was already inside the story and simply had to know what happened. The plot was also something that intrigued me, otherwise I am sure I wouldn't have continued. Of course, this experience is utterly subjective. I am certain that other people wouldn't have been grabbed in this way. Sadly, this has happened to me only extremely infrequently with all the short stories I have read this year, a number that has probably topped 300 so far, and with perhaps another 300 or more to go. So many writers seem to feel the need to introduce, set the scene, but the risk here is that your reader, who doesn't actually need to read this story, won't have the patience to wait for the action to start. Should you take that risk? My preference - and once again I say that I can only speak for myself - is for stories that don't do this. I prefer not to know, to preserve that sense of mystery that will keep me reading. I like to be made to think, "Ah, who is this? What's happening here?" rather than to find it all out at once. But there is a fine line between intriguing mystery and utter confusion - you need to drip-feed the reader enough so as not to cross over that line. I might make it through a page without really knowing exactly what is going on, but I might not be prepared to go for a 2nd page in this state - unless the voice telling the story is so completely irresistible! So, no real "rules" there for writing a short story to please everyone! Just a few thoughts that came up for me as I plough on with my Mammoth Year of Short Story Reading. I'm incredibly lucky, I am the sole judge of the Sean O'Faolain short story competition which means I get to pick only the stories I love, the ones that grab me. I have definitely found several already, and looking forward to more - of any length up to 3000 words! (Do stick to the max word limit, stories that go over this limit won't be considered.) Looking forwarding to being delighted by your entry - in an entirely anonymous way, of course! 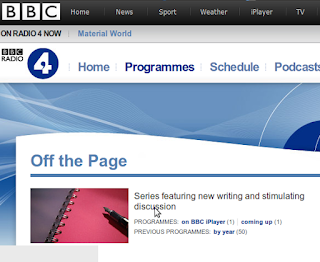 I was thrilled last week to be invited to take part - along with Dr Ben Goldacre and Dr Maggie Aderin-Pocock - in a discussion on Radio 4's Off the Page program entitled "Blinded by Science". It was broadcast today at 1.30pm and is available on iPlayer for 7 more days. I got the chance to talk about being writer-in-residence in the Bristol University labs, and I read out the first short story I've written inspired by being where science is done - not sure what the scientists I am embedding with will make of it! Hope you enjoy it, I think it was an interesting discussion! Congratulations all! Please send me your postal addresses by email (taniah@gmail.com) and I will get those out to you! I can't tell you what an amazing feeling it was hearing 16 of my tiny stories being brought to life over three fabulous days on Radio 4. I feel so unbelievably lucky - what did i do to deserve this? (Rhetorical question, no need to answer!). I feel like I will bask in this glow for quite a while. And even though I got up at 5.45am this morning to go to London and be a guest on the Radio 4 Off the page program, talking about science (was I coherent? We'll find out when it's broadcast next Thursday! ), my utter exhaustion couldn't diminish the delight. If you'd still like to listen, all three programs are now available on iPlayer, here is the link. I have had some wonderful responses from people I know and from those I don't know - and am not related to in any way - so thank you all for your support, especially my Twitter pals! It has just increased my joy! Post your answer in the comments and I will pick two winners from today and one from Tuesday and let you all know tomorrow - or perhaps Monday. Got a very busy four days... I really need a holiday! I am reading as part of the Oxfam 24-hour read-a-thon on Monday at the Oxfam shop on Marylebone High Street in London from 1pm-1.20pm, if you're in the area...I'm squeezed between some Big Names, apparently - I imagine I might be the only author to read 6 short short stories in 20 minutes!